How would you feel if your state spent $9.4 billion dollars on the roadways due to poor pavement conditions and safety concerns? Not very happy, we would guess. How do we fix Pennsylvania’s roads? And, who do you think pays for this? Motorists who are in the following “urban” areas in Pennsylvania will be paying vehicle operating costs, congestion and safety costs. Harrisburg | York | Lancaster – $1,646 | 41 percent of urban roads are in poor condition. Reading | Lehigh Valley – $1,355 | 52 percent of urban roads are in poor condition. Philadelphia – $1,798 | 73 percent of urban roads are in poor condition. Pittsburgh – $1,418 | 48 percent of urban roads are in poor condition. Scranton | Wilkes-Barre – $1,320 | 66 percent of urban roads are in poor condition. People in and around these areas are traveling to and from work, dropping and picking up children from school, visiting friends and much more. They’re driving on poorly maintained roads. “Thirty-seven percent of Pennsylvania’s major locally and state-maintained roads and highways are either in poor or mediocre condition,” according to the TRIP Report. With the rapid growth of Pennsylvania’s residents and its economy, it’s incredibly important to fix and maintain the roadways. To read the full TRIP Report, click here. Many states use a patch to fix potholes. These “patches” are not permanent and can come out with the next rain. Pothole Terminator is used to repair persistent potholes by completely removing the water-damaged section of road-base (the real cause of pothole formation) and replacing it with Mechanical Concrete®, a patented, geosynthetic technology that confines any crushed stone or aggregate material inside of a thin-walled cylinder made from waste auto tires. This cylindrical confinement dramatically improves the load supporting capacity of the stone, creating a virtually indestructible road base that resists the water generated, pothole failure mechanism. According to TRIP, for every one dollar spent on road maintenance and repair, $5.20 could be saved, decreasing vehicle maintenance costs, decrease fuel costs, decreased road maintenance and decreased emissions. Samuel G. Bonasso is a registered civil engineer, Fellow of the Am. Soc. of Civil Engineers and a career civil engineering consultant. He is an inventor with five U.S. 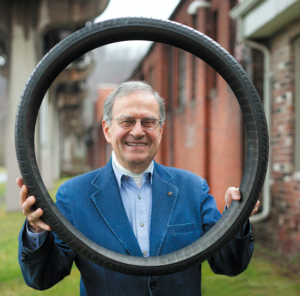 Patents, a writer and an Adjunct Professor of Civil Engineering at West Virginia University. He served publicly as WV Secretary of Transportation and as a Senior Official for the USDOT in Washington, DC. He discovered Mechanical Concrete® in 2004 and received a U.S. Patent for the technology in 2008. During that period, Bonasso developed the idea through the traditional technology development stages of modeling, field tests, lab tests and three full-scale demonstration projects.